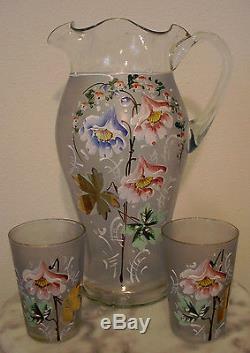 Here is a wonderful mould blown Satin enamel floral decorated 12 tall Lemonade Pitcher. This shape is pictured in a 1906 Bohemian advertisement. At 107 years old it's a true antique. The enamel decoration is in excellent condition. As usual with early blown glass there are a couple of dirt inclusions and they do not detract. On the back side there is a clear spot the size of a small finger print where the acid did not etch the glass. This is also normal with these early decorated Lemonade Pitchers. This Tankard has an appealing shape and there are no chips or cracks and no mineral deposit or stains. The pontal is pushed up and snapped of. The colors of enamel are also very nice. No damage or heat checks of any kind to the handle. The Tumblers have ground tops and then covered with gold decoration. One Tumbler had a very tiny bubble burst at the top edge but was acid stained right over top of it which means it left the factory that way. It's very difficult to see but mentioned for accuracy. Any unusual white or dark spots shown in the photos are from camera glare. This will make a great functional accessory to any Victorian home. The item "Victorian Antique Art Glass Tankard Lemonade Set with Enamel Decoration" is in sale since Sunday, September 29, 2013. This item is in the category "Pottery & Glass\Glass\Art Glass\North American\Other North American Art Glass". The seller is "ainventor" and is located in Gibsonton, Florida. This item can be shipped worldwide.